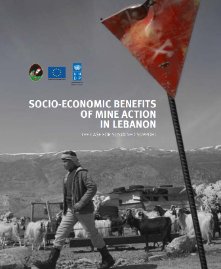 The Lebanon Mine Action Center with the support of the UNDP project funded by the EU recently developed a socio-economic assessment of mine action in Lebanon. LMAC and UNDP, in collaboration with GCNL officially launched this study in the presence of Ministers, ambassadors academics, banks, media and others on Monday March 18, 2019. Mrs. Dina Harake, Executive Director of GCNL, participated in the launcing of the Socio-Economic study of mine action in Lebanon by the Lebanon Mine Action Center & UNDP. In her speech, Mrs. Harake highlighted the importance of the study in accordance to several SDGs and invited the private sector to contribute in its further development. This study is crucial to understand the widespread impact of mine action and to make the case for sustained support which are in line with the Sustainable Development Goals. You can find the study on UNDP’s website here.